There's something appetisingly subversive about having your breaky somewhere that's also a late night bar. 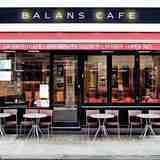 In fact Balans doesn't even stop being a late night bar by closing, having a little spruce up and reopening with a little bit more of a polite front on it, it just goes on, all the way through. So some of the people you're having breakfast with might actually still be having their night before. And it's not just a matter of being able to accompany your full English or breakfast burrito with the perfect Bloody Mary – or your pancakes with fruit and a Bucks Fizz. If you want to you can have foie gras and chicken liver terrine and a martini or sesame tuna and tempura vegetables with a glass of Sancerre. Well, if you're going to pull an all nighter you need to build up your strength! For the bright eyed and bushy tailed, the club music accompanying your breakfast will either remind you of being at a cool down session in the gym, or else on a clubbing holiday in 2002. And you might feel the need to dodge your glance in the mirrors angled over the tables for fear of a second ruder awakening, but Balans is one of the best places in the world to people watch over your scrambled eggs. Which are always done well – not too sloppy or too hard – and they serve real cubed and fried potatoes and a veggie fry up option that's by no means bland or disappointing. As you can imagine the coffee is also to be relied upon. There's not really a theme to the late night menu if you did want to try something outrageous for breakfast, but the variation is good. It's the entertainment factor of being in Soho at this time of day and guessing who's come out and who's still out that makes a Balans breakfast really worthy of getting up for. Tip: An Amaretto Sours goes surprisingly well with Maple Pecan Pancakes, it's like strudel.